1. Why this series at all? Mainly, because I see the need for a collection of concisely stated, easily accessible articles covering much (ultimately most?) of what a violinist needs to know in order to play the baroque violin. Over my many years of teaching I have so often been confronted with the same questions, and the answers remain unsatisfactory - sketchy, sometimes even vague. Of course, I know what I believe, and why, but there's nowhere simple to send my students to look for themselves. Yes, there are the (ever increasingly available) sources - but it requires skill, background knowledge, time, patience and determination to assimilate them. Yes, there are secondary sources, the books about the subject. Boyden's History of Violin Playing of course remains invaluable, Greta Moens-Haenen has written two highly interesting books, Vibrato and Deutsche Violintechnik im 17. Jahrhundert (German Violin Technique in the 17th century) - currently only available in German - Robin Stowell, Clive Brown - fantastic in depth studies, but focussing more on the classical and beyond, Judy Tarling's Baroque String Playing for ingenious learners, to name but a few. But none do exactly what I want - namely, to present a succinct, comprehensive and objective coverage of the sources, topic by topic, presenting as simply and clearly as possible what we know - and that clearly separated from what we might conclude, conjecture or opine. This, then, is my attempt to do just that. 2. Why have I called the series “Traditions of Baroque Violin Playing”? Well, put as briefly as possible (and to let you off having to read the rest of this Essay), because I think that the tradition of baroque performance style was absolutely lost during the last quarter of the 18th century, and what we (“early musicians”) have re-created over the last 50 years or so is a new tradition - which has created its own momentum and followers. But, and this is key, it is not the truth. I do not mean to say with this, that it is wrong. I only mean to point out that what we have today is a re-creation, an interpretation. And such a reconstruction is NOT the original. And there is something else to throw in, before I get down to the Essay proper, which is best said by Leopold Auer - himself the founder of an important tradition of violin playing in the 20th century. He said, variously (in Violin Playing as I teach it) “I have no respect for that much-abused word ‘tradition’.” And: “Tradition in reality weighs down the living spirit of the present with the dead formalism of the past”. And: “Forget tradition. Dismiss the idea that you must try to play such and such a work just as so and so plays it”. Yes, absolutely. I am definitely not proposing that we exhume the corpse of a lost baroque tradition. On the contrary, I am proposing that in order to recreate anew we must build our style, our opinions - and hence our way of expressing - on as solid a foundation as possible. That means understanding fully, to the best of our ability, the sources - the tradition with which we are dealing . tradition n. The principles held and generally followed by any branch of art or literature, acquired from and handed down by experience and practice. In violin playing, tradition has long been an important aspect of education, and to many a touchstone of quality. Many years ago, I was given a book - The Book of the Violin, edited by Dominic Gill - a wonderful wide-ranging collection of articles by various authors covering the vast history of the violin. Included is a full page chart entitled “The tradition of Corelli: A teacher-pupil genealogical tree.” This chart fascinated me - still does! So clearly, I could see that I am a direct descendent of Corelli, thus: Corelli - Somis - Pugnani - Viotti - Rode - Böhm - Joachim - d'Aranyi sisters - Orrea Pernel - me!! Can this be true? Joachim, at least, was very clear that he was following a significant tradition. In a letter to Liszt, marking his break with the modern German school of Liszt, Wagner et al., he wrote: “I am completely out of sympathy with your music; it contradicts everything which from early youth I have taken as mental nourishment from the spirit of our great masters”. And indeed his edition of Corelli (undertaken in collaboration with Chrysander) is an outstanding example of a sense of responsibility to history. Tradition is of course a fluid concept - a style which is followed but changes with each new generation, even each separate individual. I enjoyed my lessons with Orrea Pernel beyond measure - she had a penetrating musical insight, and a sound which was inspiring - like being in the presence of one of those old 78rpm discs! Recently I have been in conversation with my Uncles - John and David Gwilt - who played in a piano trio with Adila Fachiri (one of the d'Aranyi sisters, who were the grand nieces of Joachim) in the 1950's. Adila, who taught Orrea Pernel often quoted “Oncle Jo”: “only use vibrato for the important notes in a phrase” and “Oncle Jo played it this way”, were apparently oft repeated. Wanting some yardstick by which to measure Adila's sound, I asked my Uncle David if Pernie's (as we all called her) sound was like Adila's: “heavens no”, was the response, “Adila's sound was much more powerful, more intense - but never pushed or aggressive.” We have the luxury of having recordings of Joachim, of Adila, of Pernie - and in listening to these, I think we can hear quite distinctly how a tradition is followed and yet constantly evolved. Here is the Brahms Hungarian Dance no. 2 in d minor, first in Joachim's recording (1903, just four years before his death in 1907, when he was over 70). Sorry - your browser does not support the audio element. And then, the same piece, recorded by his great niece Adila Fachiri in 1924. Sorry - your browser does not support the audio element. Sadly, I don't have a recording of Orrea Pernel playing Brahms, but here is the opening of the Allemande from the second Partita for solo violin by Bach. Sorry - your browser does not support the audio element. Here you can hear at least the rich dense tone, albeit with a clearly perceptible increase in the amount of vibrato. So to talk of a line of tradition from Joachim (and therefore, Brahms, Mendelssohn, and even, once removed, Beethoven), certainly makes sense. And it is absolutely possible, to see Joachim's style nascent in the French Violin School of the early 19th century. When you read the French Conservatoire “manifesto” (The Méthode de Violon of Baillot, Rode & Kreutzer, 1803), Baillot's later L'Art de Violon, (1834) and Spohr's Violinschule (1830), you see one line of tradition, and you read of a style and technique very resonant of what we hear in Joachim's playing. And of course, it was not an overnight change. Looking at Galeazzi, Campagnoli, Reichardt, we can see this new style, technique - a new tradition - being introduced. The “tyranny” of the down-bow is released, the ideal of keeping a melody on one string is strongly proclaimed, the martelé stroke is proposed. Indeed, the seeds of change are planted even a generation earlier - Tartini and Geminiani encouraging a relaxation of the Rule of the Down Bow, Leopold Mozart presenting the idea that a melody sounds better on one string. ... the line to Viotti can be followed thus - from Corelli came Somis, admired throughout Europe (“He was regarded as one of the greatest masters of his instrument of his time”, wrote Charles Burney in his General History of Music). Somis' pupils included Giardini, Leclair and Pugnani. Pugnani's playing was renowned for its power, eloquence and rich cantilena; his arco magno (grand bowing) was reportedly legendary. Pugnani in turn taught Viotti who wholeheartedly embraced this emphasis on a powerful singing sound and developed it further. Then, indeed, if certain versions of history are to be believed, Viotti himself is more or less single-handedly responsible for the advent of the French conservatoire style, Rode, Kreutzer and Baillot claiming their school to have arisen directly from Viotti. So what happened? This does look like a single line - where is the break?? I suggest that the most significant single factor - the motor of the establishment of a new tradition - is the bow. The entire baroque period - let's say for the sake of argument, 150 years from the birth of the “seconda prattica” around 1600, to Bach's death in 1750 - is characterised by the use of the pike-head bow. Of course, these 150 years saw enormous development in musical style and taste - the tradition, if you like evolved hugely, but throughout the period the bow maintained its light tip and convex shape, with its concomitant natural tendency to differentiate distinctly between up and down bows, to articulate clearly, and to shape notes. But during these turbulent years of change - the move forward into the classical era around 1750 to 1790 or so - we see the gradual development of the “transitional bow” - the swan-head, through hammer-head to the modern axe-head as established by Tourte (in France, simultaneous with Dodd in England), paralleled by the development and establishment of a concave camber and a lengthening of the bow. 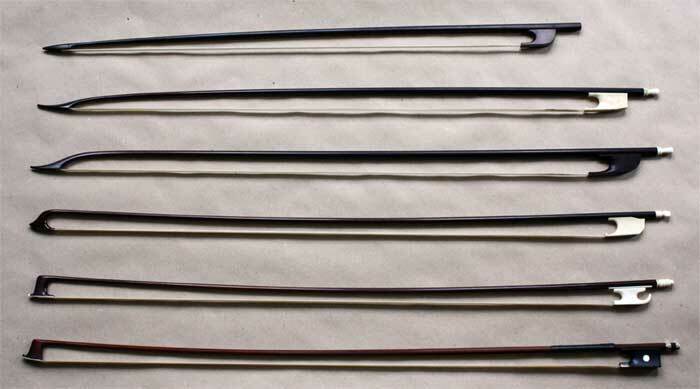 Here are six bow tips, showing the progression from the early baroque (nearly straight to the tip, withb little separation between hair and stick at the tip, through two “high baroque” pike-head bows, showing a gradual increase in separation at the tip, to a swan-head, hammer-head and finally modern axe-head. Parallel with the development of the tip, one can see the form of the stick changing from straight, through convex curve to concave. As the new transitional bows appeared, the violins themselves were “updated”, sometimes with drastic measures, showing little regard for historical consideration, and the old baroque bows were simply (and so sadly) thrown out. You can't modernise a bow. And as the equipment was updated, so the technique - and no-one looked back. Long legato bowing, equality of up and down, - alongside the commonly acknowledged differences in musical style - singing instead of speaking, melody over motive - became the new tradition And thus our “direct line”, which I think is clear from Joachim (and maybe even from Rode et al), is broken. The old tradition went the way of the “old” bows - thrown out! So what of today? What of a baroque performance tradition? If indeed with the passing of the baroque bow, any “real, live” connection with the baroque playing tradition was lost, what are we to do? We have absolutely no idea what it sounded like - no recordings - only some surviving instruments (and fewer surviving bows), the sources - instructional treatises, descriptions penned by interested observers (North, Burney etc) - and we have the music. So far, so clear. But here's the rub ... how to interpret this material. How to re-create the fire from the ashes! These days a new “early music” tradition (called, I gather, HIP - Historically Informed Performance) has been established - starting with the ground breaking work of Dolmetsch, Munro, Harnoncourt, Leonhardt, Kuijken, and many others. Since the beginning of this movement, an enormous amount of source material has been uncovered, discovered, re-discovered, and an entirely new edifice has been built. BUT, as mentioned above, it is a new tradition. It is a tradition built on the interpretation of all too often disturbingly unclear sources. It is a tradition full of opinions, controversies and uncertainties. We have, for example, the chin-on versus chin-off discussion (See my first Essay, Holding the Baroque Violin). We have the historic strings discussion, we have controversy over “double-dotting” (itself a 20th century term), over inegalité. Moreover, “Early music performance practice” seems to some extent to be a thing of fashion - as a new treatise is uncovered, or at least a new understanding thereof, so a new line of tradition becomes established. Now, as then, there are distinct national styles. But the difference is, today's styles are based on individual's assessments of the sources, and are applied across the styles and nationalities of the baroque. Here are six different recordings of the opening phrases of Purcell's Sonata VI in g minor from his Sonatas in Four Parts, London 1697. First recording Sorry - your browser does not support the audio element. Second recording Sorry - your browser does not support the audio element. Third recording Sorry - your browser does not support the audio element. Fourth recording Sorry - your browser does not support the audio element. Fifth recording Sorry - your browser does not support the audio element. Sixth recording Sorry - your browser does not support the audio element. The extracts are anonymous, I'll tell you only that the following nationalities are represented: Holland, France, Spain, Germany, England. Notice particularly how the different groups deal differently with: tempo, vibrato, trills, note shapes, rhythmic interpretation, and ornamentation. And all this before we talk about “phrasing” or “musical playing”. My point is not that one is better or worse than the others (although, of course, I have my personal prejudice), but that such respected musicians (for that they all are) can reveal such a different interpretation of the sources. When the early music movement started, we were all pretty much left to ourselves. My first fumblings with a baroque violin involved borrowing an instrument after an inspiring concert on baroque instruments (thank you Alison Bury and Ars Musica in Ann Arbor, in 1980), borrowing Geminiani and Leopold Mozart from the library, and attempting to make something like a sound. I dropped the instrument over the back of my shoulder twice and subsequently practised on the bed, so the violin would have a soft landing! Now one can study baroque violin at College or University, learning from a teacher with a specific style, and therefore in one line of “tradition”. There are orchestral training courses, jump-starting an understanding of many of the fundamental elements of what we assume to be the baroque tradition. But, habit, fashion, opinion and dogma have established new traditions, sadly all too often accepted blindly at face value by the younger generation. I know, for example, of one student who informed me that she learned what she knew about baroque playing from YouTube, and the 30-second free clips on Amazon. No - the point is this: if you're going to bother playing the baroque violin, you've got to open your mind, develop your curiosity, you've got to think about what you're doing, you've got to ask what, how and why at every corner. An inspiring teacher, an eccentric or particular view on holding the instrument or on tempo, all fine, but you have to ask why? Tradition is a valuable measure, but use with care! And that is why I have embarked on this project. Not to tell you the answers, not to “reveal the truth” - how should I know? Simply to encourage the questions, and to point to where some of the answers might lie.